With the Pointer tool you can select existing objects. 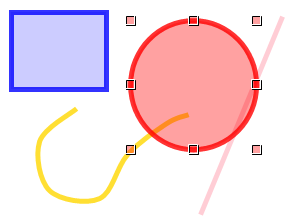 Objects must be selected before moving them, changing their properties (such as color or size), or even removing them. A single object can be selected by choosing the Pointer tool, and then directly clicking on the object of choice. An object will show its handles when it is selected. 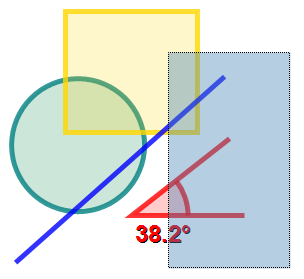 In the example below the red ellipse has been selected by clicking on it, showing its 8 handles. When clicking on an area where multiple objects would qualify for selection, the object that is on top will be selected. Multiple objects can be selected by clicking an object while keeping the Ctrl-key on the keyboard pressed. Alternatively, multiple objects can be selected by choosing the Pointer tool and then dragging on the image while holding the left mouse button down. While dragging you a rectangular selection area is shown (as a dotted outline with colored interior). Objects will be selected if they intersect with this rectangular selection area. 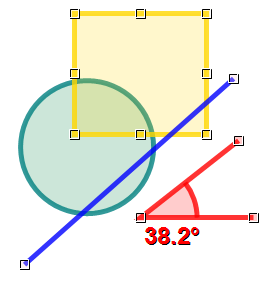 In the example below, the yellow rectangle, the blue line, and the red angle have been selected because they intersected with the rectangular selection area (shown as dotted outline with blue interior below). Step 1: drag selection rectangle (shown as dotted outline with blue interior below) while holding left mouse button down. Step 2: release left mouse button, selected objects will show their selection handles. Once an object has been selected, it can be moved to a different location on the image. Move an object by dragging it with the mouse while keeping the left mouse button down. Use the same method to move multiple objects. Once an object has been selected, it can be resized by clicking and dragging one of its handles. Generated on 4/18/2019 7:22:12 AM (PST) ADI/HQ/GBA/2019/ARIELCLOUD/v3.0.2018.0126.